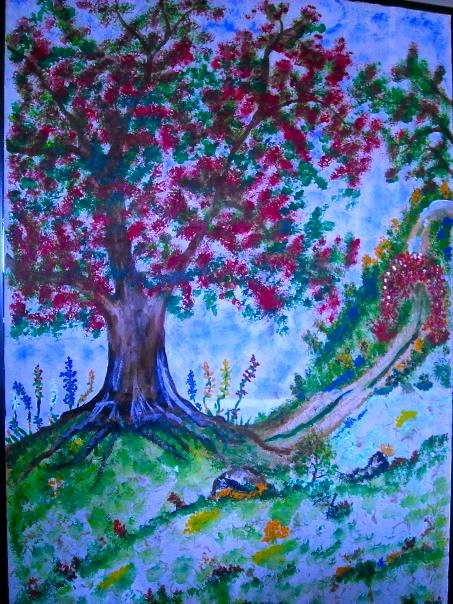 Window Painting by my mother. Practical artwork–my dining room windows looked directly into the side of our neighbor’s house. 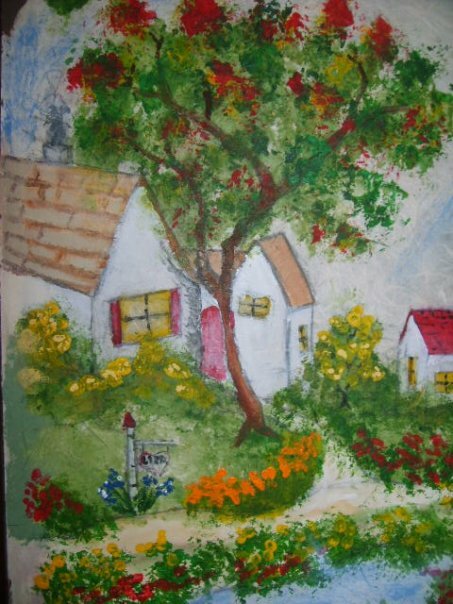 I glued handmade papers to the windows and asked my mother to paint a scene across the three windows to create privacy & beauty. Also, it was an excuse to get my mom to Dallas, have our kids watch her create & have another lasting creation of hers of my own. God plants in each zygote an idea, a desire. Then we spend the rest of our lives discovering that seed. Only Jesus can nourish that seed with living water. If we have the faith of a mustard seed, we can command mountains to move. So no surprise that this implanted embryonic desire for a specific ‘something’ that starts off small as a mustard seed, can grow into a mighty redwood, with its canopy placed sky high and its roots reaching deep and wide. Give your life over to God. Study His word and spend time over coffee with your new friend. Through conversations, He will woo you and tell you sweet everythings about you. As you tell Jesus how much you love Him, he tells You how he loves you more. Then, as with all love relationships, He can’t wait to give you a gift that He has been preparing and planning for a long time. He hints at, guides, and whispers the gift–your purpose–the implanted desire of your heart. You clasp your hands in giddy excitement, grinning goofily with shocked amazement at the specific simplicity of it all. You dive in. You get to work, which runs through your body like play, and discover that your purpose, the thing that makes your heart sing, makes God smile and serves His kingdom. Because everything we do is about love and bringing more people, with their tiny mustard seeds, to Him, ready and waiting to water, grow, and present His implanted gift to you. Thank you for allowing me to attempt a little poetic proselytizing. It is true. God wants to give us the desire of our hearts. In fact, He put those desires there just as He did our lungs, brains, fingers, toes, and brown, blue or hazel eyes. Give up and give it over to God. Crawl into His lap like a child and let Him take your worries. He will smooth your hair, whisper sweet everythings, and water your deep-rooted mustard desire into solid redwoods. Everything this journey is about is not for what You will do for me and my family, but how, after growing closer to You & learning to listen more astutely and rely and live on You–FAITH!–this journey is about what I am to do for You. I am weak & small, but I know You’ll use me whenever, wherever for Your purpose. I pray for courage to accept Your path & for a mind that never forgets what You have done for me (not like the Israelites–ungrateful babies). Please Lord, be with Bob now during his back surgery. Give him, Jill & the kids a peace & a knowing that You are with him. I pray for a quick, pain-free recovery. In Romans 5:1-5, You gave me this reminder in order to remain faithful to the lessons of this journey & to You! “So now, since we have been made right in God’s sight by faith in His promises, we can have real peace with Him because of what Jesus Christ our Lord has done for us. For because of our faith, He has brought us into this place of highest privilege where we now stand, & we confidently & joyfully look forward to actually becoming all that God has had in mind for us to be . You are true to Your Word. Greg will have an interview with Darcy next Thursday, Feb, 6th! We know this is Your work. You are showing Your hand of what You have been planning and the very exciting part of it all is it will be the beginning of Your continual plan. Thank You, Jesus! Another portion of the window art triptik, a three panel window covering made with handmade paper, and painted with my mother’s love. Thank You, Jesus for all You provide–my wonderful marriage, which is centered around You; my amazing children, 3 gifts from You; our health, especially without health or car insurance; & this journey, with its sole purpose to grow closer to You & to discover what I can do for You. Lord, this morning I pray for Your vision for me. What will You have me do for You? I believe that You have begun to make it clear–the beginning. I pray to know Your vision; Your will. Peace. Knowing. Understanding. Resolution. Singing birds outside my window. Faith in you. My mustard seed has sprouted like a redwood. Purpose: to love & serve You. Wow! Walk before Greg today at his interview with Perot. Peace, focus & Your plan unveiling before our eyes. Thank You now for using the weak. Greg & I were married in a church in Austin and held our reception at Willie Nelson’s place. The Alvin Crow band played all night and I taught my new yankee in-laws how to do the Cotton-Eyed Joe & the Schottische. As I and my two girl friends strutted around the North Forty dance floor looking for one of their boyfriends, I had a God moment. Just like in the movies, all went hazy around me as I first saw Greg’s blue eyes. They seemed to come towards me even though his feet did not move. The sensation radiating from my inner being must be what it’s like to feel the hand of God. I had written in my prayer journal back in 1985 that God would let me know when He would answer my prayer for a best friend. 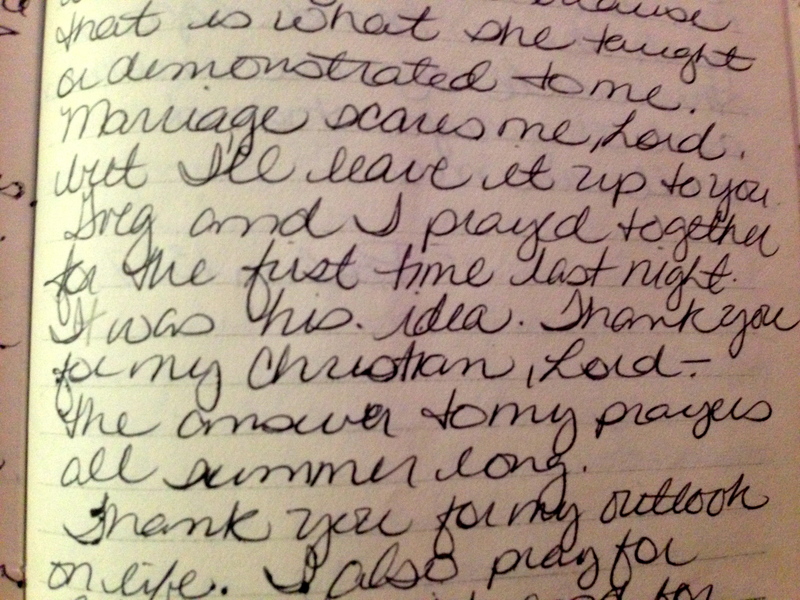 As you’ll see in my journal entries, I prayed often for my future husband, with His answer coming ten days after the last post when we met, danced to ‘Footloose’ and I taught my new yankee to kicker dance. I pause blogging from my journals starting in 2003 when Greg and I journeyed through job loss while raising our three kids (see previous posts). 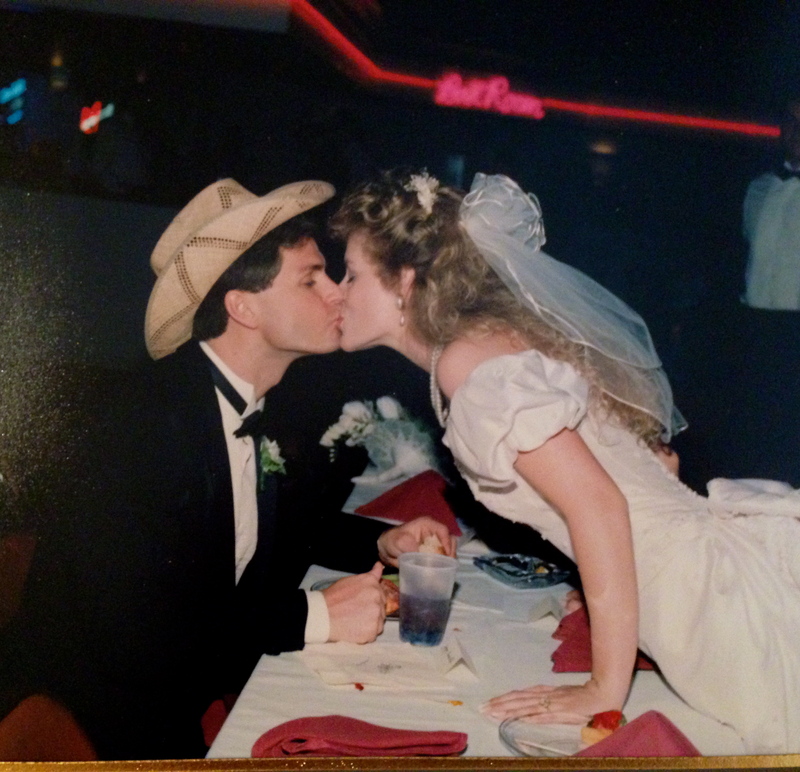 Today, we celebrate my 26th wedding anniversary and how God answers prayers. 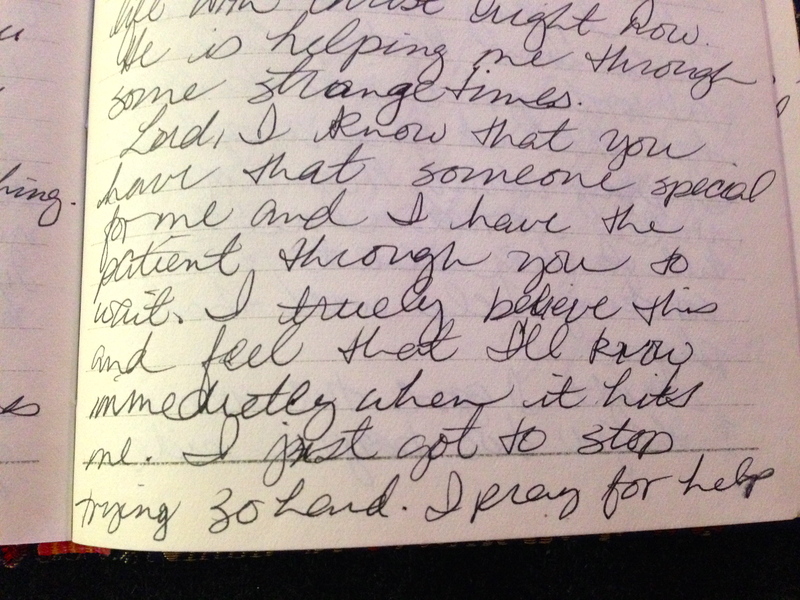 Below is is an entry into my first prayer journal from June 29, 1985. Greg and I met in Austin at the North Forty, through friends ten days after this post. 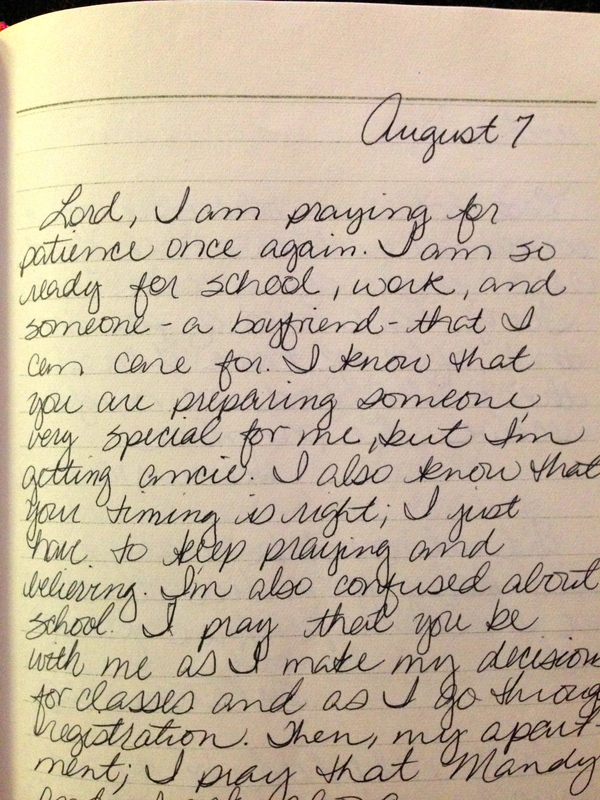 The night before, on August 16th, my friend Becky prayed with me for my best friend. And I know when we first prayed together. Prayed in and prayed through, our marriage is a divine appointment. Now, I pray for my children’s future marriages that they too will have the honor and joy of living life for Him with their divine someone. 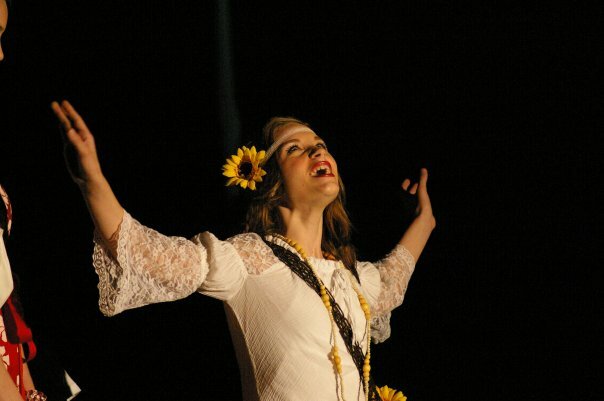 Liza as Joanie in the musical “Waltzin’ Matilda” at Lucas Christian Academy, 2006. Joanie is a traveling companion with Matilda, who are both on a journey to leave their familiar, loving homes to discover more about life. They find out that they need God to protect them and that His love is enough. Hope is addicting. It keeps you going. You look for it everywhere and will accept the tiniest morsel. You can put your hope in many things–people, nature–but those do not have an eternal, non-ending supply of hope. Those will fail and fall short eventually and they don’t have your best interest at heart. To some, believing in the unknown is any bad four-letter word ready to spew us out like sour milk. To others, hope is l-o-v-e. Undying devotion to a divine promise. I believe I was born with hope. I don’t have a wiz-bang, up-from-the-ashes conversion testimony. I’m pretty boring when it comes to that. I’m more of a day-to-day, one-on-one, live-my-simple-life-as-best-as-I-can-with-Jesus kind of testimony. I’ve always believed in Jesus–His story, love, hope, and heaven. And I look for Him and what He’s doing everywhere. I want to know what He wants my part in His plan to be at that moment. That is adventurous living in my book. 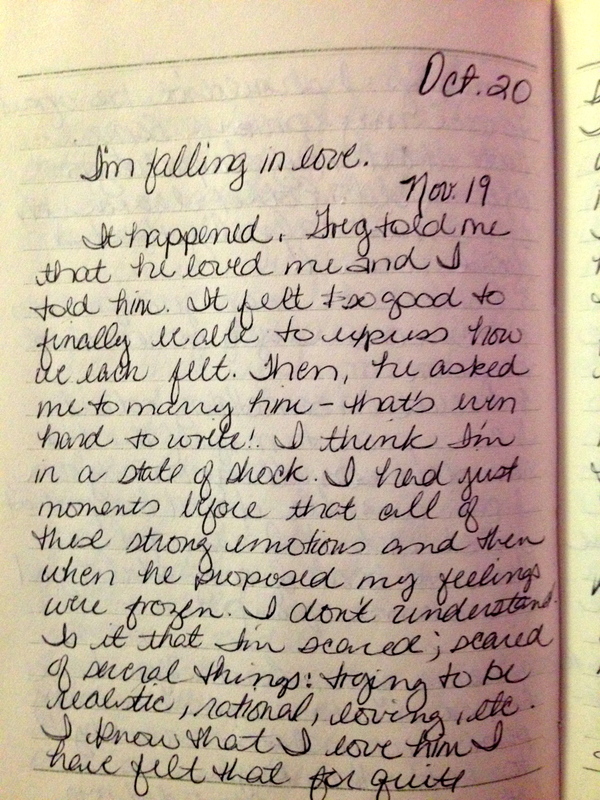 The journal entries below are me praying to God and Him giving me hope through His Word. At the time of these entries, it is my family’s one-year anniversary of no job and hope was our only income. Here, hope is manifested in my new job, Greg’s next interview, and God’s promise for restoration and blessings. With hope, the outcome is always unknown, but the possibility of what God will do in the process is exciting and endless. Another good morning. Purpose ensues. I pray for continued awareness of my immediate purpose. Thank You, Lord for taking me to Lucas Christian Academy. I was hired yesterday and it is clear that Your hand is over this. Thank You. Please let me let go & let You lead me through to find the right script first of all and then guide through each step that follows. The sun shines today. My heart is glad & I can’t wait to tell of Your amazing story with me! Yes, I continue to pray for Greg & his career opportunity. Please continue to progress his opportunity with Perot. Please alter Darcy’s opinion of Greg to a positive. Open his mind to see Greg’s accomplishments & possibilities. We pray for swift movement with the Perot job for us. In Your awesome power all is attainable! Could today be the day? Could today be the beginning of our end & beginning? Dear Lord–How and what do I pray for now? I have continually asked & repented & given for over a year. I have learned considerable patience to the point where everything in life is bland. No need to get excited if it’s all going to dash–just wait. That is not me. I’m a passionate person. Smiles are frequent usually, dancing unexpectedly is common & expected quite frankly. I have grown closer to You, but I’ve become a different person. I’m calm, but boring. I’m yearning, but not obviously. I’m here, but mute. Can we strike a balance? I want all the changes You’ve made in me, but I need to dance, Jesus. I need to dance from deep down within. With an obvious spring well of Your love from You. I won’t be quiet! I’ll praise You to everyone at every turn! Bless me today Lord with all of the blessings that You have been preparing all this time! I pray that You prepare the hearts & minds of the men &/or women of Perot that who will meet with Greg today at lunch. PLEASE let them spark at Greg’s opportunities & his potential for positive leadership & growth for Perot. Move like a freight train, Lord! So much is riding on You Jesus. It’s been You only that we’ve relied on, please let everyone know that You are there for them too because You were there for us. I am quiet to hear You. Clear-headed. Quiet. It ends with the 11-23 verses about the end of fasting & the promised prosperity!!! So sayeth the Lord to me this morning. Thank You, Jesus. I pray to You humbly, excitedly & with great ancipatoon. I pray for courage with accepting Your answer & for abiding Your commands exactly forever.